Name: Tong (also known around IPPL as Tiggy, Ting-Tong, Tiggles, etc.) ADOPT ME! Tong began her life as a wild-born gibbon in the forests of Vietnam. She was captured and sold as a pet to an American serviceman, who took her with him when he moved to Thailand. When the serviceman returned to the U.S., Tong was left with servants who fed her an inadequate diet. As a result, she contracted rickets, a permanently deforming bone disease. She then became the pet of an embassy employee who asked Shirley to take care of Tong when she was transferred out of the country. At that time Tong was black in color with light cheeks.  It was 1974 and Shirley had just founded IPPL the year before. Tong has always been very people-friendly. If she likes someone, she will not only accept grooming from that person but will groom her human friend in return, accepting him or her as an “honorary gibbon.” She is also very attentive to her mate Gibby though she will steal food from him, especially if it is fresh mango, which is one of her favorites. Tong, whose name means “gold” in Thai, is different from the other gibbons at IPPL who are members of the white-handed gibbon species. 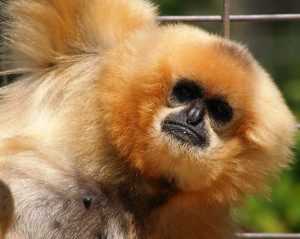 She belongs to the “yellow-cheeked crested gibbon” species. In 1976, her black coat started getting golden spots, and finally it became completely gold. Her adult coat color is gold, with a little patch of black on the top of her head. Her song is quite distinctive from that of the other gibbons and ends with a lovely, bubbling trill. She is quite the chatterbox and will give an excited squeal when her favorite staff members come to give her attention and treats.